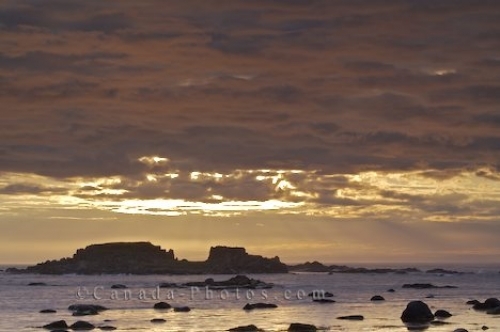 A layer of dark clouds highlighted by the sunset lighting and possibly bringing with them the threat of a storm, hover over the rocky, jagged island off the town of L'Anse aux Meadows in Newfoundland, Canada. At low tide, boulders appear above the surface of the water scattering themselves across the coastline as the waves crash against the rocky island. Where the line of storm clouds end, the sky is illuminated in a lighter hue at sunset. The thick dark clouds appear unique with the pinkish tones outlining every shape in them. The coastal shores in L'Anse aux Meadows provides the ideal location to sit and watch the sunsets bring in their array of colors across the Newfoundland sky. Picture of the rocky island off L'Anse aux Meadows in Newfoundland at sunset which is filtered out by the storm clouds. L'Anse aux Meadows is a town filled with history and was once home to the first genuine Norse village, it being the only one found throughout North America outside of Greenland. European exploration and settlers landed here before Christopher Columbus and it was not until 1960 any remains of the Norse village were found. The weather around L'Anse aux Meadows is a mild maritime climate, but the weather systems can change quickly bringing with them wind, cool temperatures and possible storms.